As you probably guessed from my previous post, I started going to a knitting club again. It is a great experience and I enjoy it very much, but talking or listening to other people talk don’t help with concentration. Unfortunately, almost at the same time in January I started an EXTREMELY challenging project. I am still not used to documenting my knitting in details, yet, this time I decided to write down everything – just to understand the process better. It was painful and, at times, I reminded myself Dory, the fish with short-term memory loss, walking around and repeating things before I forget them. You can find most of my notes on Ravelry’s pattern page and Instagram. 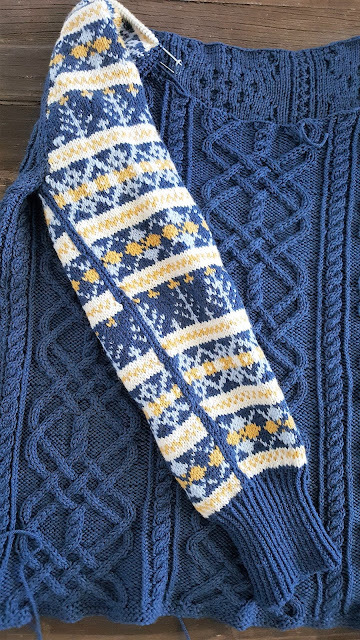 My inspiration for this project was this incredible design as well as many Pinterest pictures of sweaters with mixed patterns. The Iron Work pattern by Madeline Lee that I used for the body had been in my wish list for a while. It looks really beautiful but when I bought and downloaded the pattern I discovered that it had no charts for the cables and no schematics whatsoever. Just words, words, words. Do you like knitting a complicated cable design from row by row explanations? I don’t. I need a picture that is worth a thousand words, at least for me. Plus for this pattern almost all stitches are knit through the back loop (right and wrong side) which slows the work down and usually is painful for my hands. Yet, one day I just sat down and started deciphering the row-by-row explanation. After several hours and false starts, I finally memorized all the abbreviations and was able to see the inner logic of the cables. Actually, this is the reason why I love cables so much. Not only they look good on a finished garment and make it warmer, they are extremely logical. Even though I hate life’s randomness and unpredictability, I know that it cannot be helped (I go with statistics and science on this one). However, there is nothing random or unpredictable in cables which make them so endearing to me… When you’ve got to cross stitches to the left, you cross them to the left no matter what till the end. Isn’t it great? Anyway, as soon as I figured the cables, I started thinking about simplifying the pattern. Because I like going out of my comfort zone but up to a point. In general, I like comfort more than discomfort, and I have a hunch I am not alone. Knitting all stitches through the back loop and making some other twists and turns that are not critical to the overall design seemed just too much (I tried to explain better on my Ravelry page). So I just didn’t do it. And the cables still looked good to me. For the sleeves I picked the fair isle pattern that I have already used a couple of times. 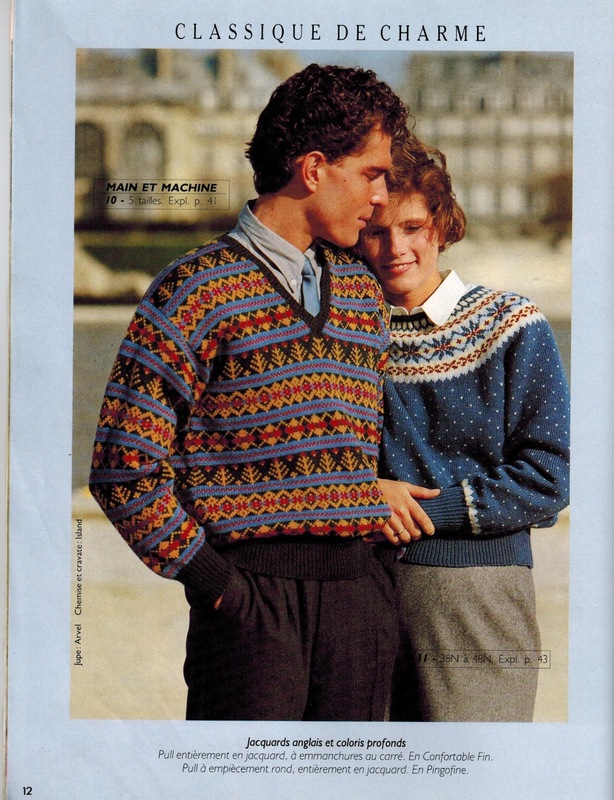 It is from the same old French magazine that inspired me to knit my Blue disaster cardigan. I made this sweater in fair isle pattern all over many years ago. Unfortunately, the yarn I used for it was cheap, extremely scratchy, and the colors would run if washed. In other words, I spent several months making a sweater that was impossible to wear. It was a BIG lesson for me – not to make a difficult pattern from cheap untested yarn. I used Rowan pure wool 4ply that I tried first making Juno and liked it a lot. The yarn is discontinued but I managed to find quite a bit of it in different colors. It has a very good stitch definition, is soft and squishy at the same time, and the colors are not bright, a little bit subdued, dull, which makes the colorwork interesting but not showy or flashy. The only drawback was that I couldn’t possibly take this project with me to the knitting club. To solve this problem I had to start something simple but useful. This is why in January I was working on several projects at the same time – shocking, I know! First, I had to use up the leftovers from my Blue disaster cardigan (I had 6 balls left). I found this simple elegant camisole and finished it very quickly. I didn’t change anything in the pattern, but the finished garment turned out to be too revealing for my taste (or, maybe, I turned out to be too prudish for this garment), so, to avoid showing too much of my bras, I stitched the seams much higher than in the original pattern. Then, I had 10 balls of Debbie Bliss Cathay in an amazing purple color. I used the same yarn for Beloved last summer and was really disappointed at how much it stretched after washing. My first instinct was to use cables to prevent it from stretching. And then I decided to think outside of the box (our living room/the only room was covered with boxes at the time so it was rather easy to do) and to go with the yarn. If the yarn wanted to stretch let it stretch. I made a big swatch, washed it, and stretched as much as I could. 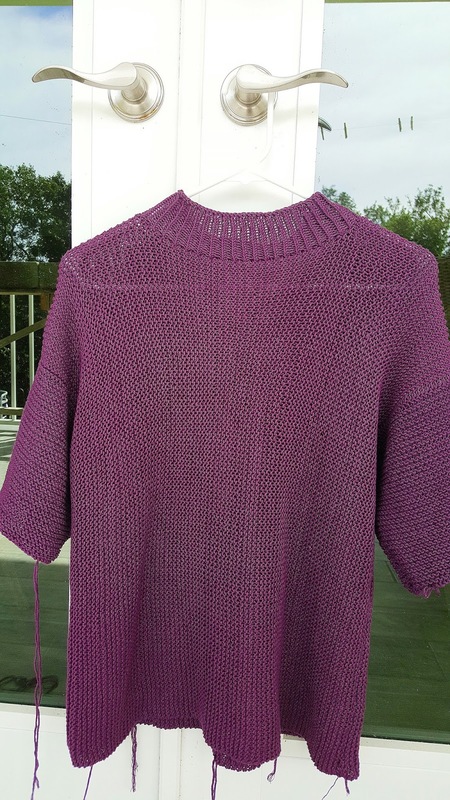 When it dried I calculated my gauge and started a simple garter stitch t-shirt. 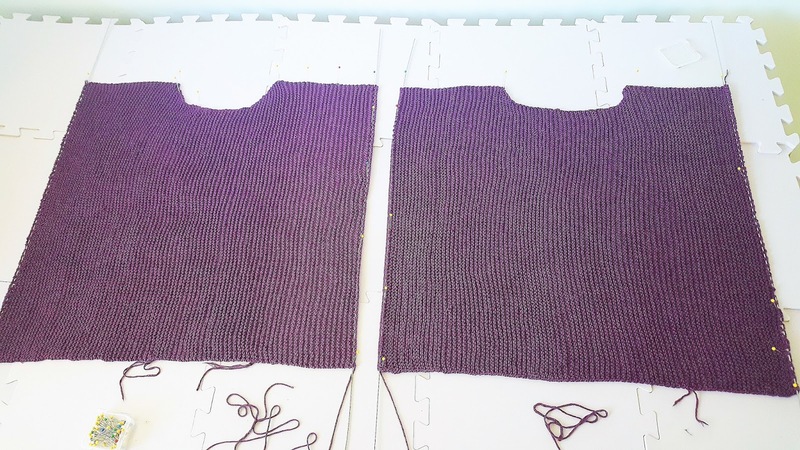 The body is knit from side to side with some decreases/increases for neck shaping. When finished, front and back were sewn together and I picked up stitches for sleeves that were knit flat. I had just enough yarn for the collar. This t-shirt is very light and airy, perfect cover up for subtropical winter weather. And the color is to die for. The pine cone was found under a palm tree – a big mystery where it came from! Moreover, the pine cone looks like it was trying to disguise itself as a pineapple which makes sense – pineapples are much more common here than pine cones. 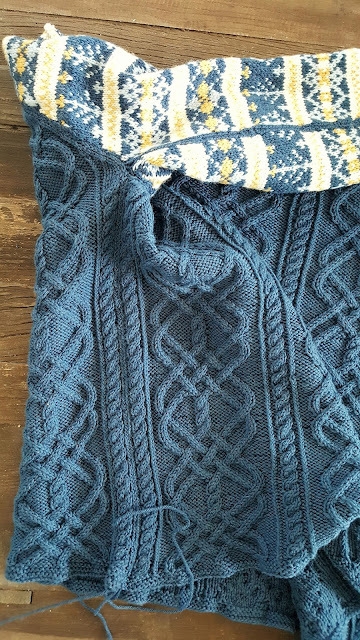 Meanwhile, my work on the blue sweater is almost done (I’ll post pictures and final notes soon) and I am already planning my next project from this yarn. It seems that when a designer uses same materials and same patterns for different garments they become a collection. I am not a designer, but I think I can say that I am working on my own collection of sweaters and cardigans from Rowan pure wool 4ply. And I love every minute of it!